This is a media release cross-posted from the Aquarium's News Blog. Support the Aquarium and their rescue efforts here. Over the last few days, more than 45 endangered sea turtles of three different species have washed up on the shores of Massachusetts' Cape Cod Bay near death with body temperatures in the high 40's. Most people don't think of sea turtles being in New England waters even in the summertime so much as just weeks before the winter holidays. Dr. Charles Innis, the Aquarium's head veterinarian and a renowned turtle specialist, listens for a heartbeat on a newly admitted 60-pound, sub-adult loggerhead sea turtle. Turtles with temperature in the low to mid 40's can come in with a heartbeat as low as one per minute and still be re-warmed. Reptiles are tough and amazing. Wednesday with winds blowing steadily out the northeast, the wave activity carried these mostly inert turtles on to the beaches of this beautiful but sometimes deadly peninsula. The juvenile two to ten pound Kemp's ridley and green sea turtles and the 40 to 70 pound sub-adult loggerheads migrated up the East Coast early last summer to feed mostly on crabs in these rich, marine waters. In September, the instinct to swim south was most likely clear but once on the north side of Cape Cod, these young turtles were not able to solve the difficult navigation problem of getting out of the deadly bucket of Cape Cod Bay. Swimming south, east or west leads to land barriers. Swimming in the counter-intuitive direction of north for 20 miles is the only safe passage out before turning south at the tip of Cape Cod. 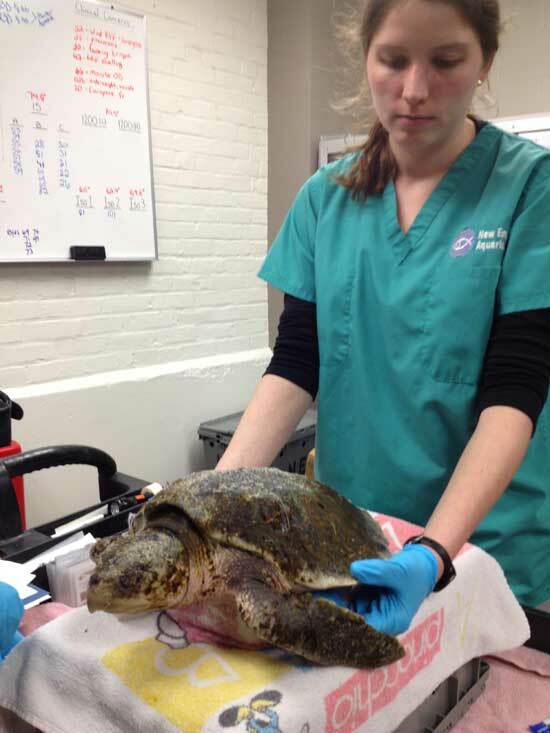 A juvenile green sea turtle on medical intake on November 28. Note the fungus and build-up of materials on the shell due to lack of activity. For those sea turtles that fail to do so, they slowly become hypothermic over two months as water temperatures steadily decline through the autumn. By November, the remaining turtles are near death with low body temperatures but are also usually severely dehydrated, malnourished and host to a variety of infections. If they are lucky, the first steady, strong winds of the winter push their inactive bodies ashore, mostly on the Outer Cape. There, dedicated staff and volunteers of the Massachusetts Audubon Sanctuary at Wellfleet Bay walk the beaches in often brutal weather conditions to find the stranded reptiles. It is a life and death game of beat he clock as rescuers try to find the sea turtles before scavengers such as coyotes, raccoons or sea gulls do. Turtles once found are collected and brought to the sanctuary headquarters. Four times on Wednesday, volunteer drivers left Wellfleet to drive the 90 miles to the New England Aquarium's state of the art sea turtle rehabilitation facility in a retrofitted, brick warehouse in the old Quincy Shipyard, ten miles south of Boston. There, Aquarium biologists, veterinarians and volunteers quickly and efficiently triaged, cleaned and treated the new patients. It was not unlike a scene out of a big city ER. The 45 new patients over the past three days are each being slowly re-warmed five degrees per day. They were greeted by about 45 other sea turtles that had stranded since early November were now busily swimming in the rehab's center large clear tanks. With over 90 turtles rescued and several weeks remaining in the stranding season, Aquarium officials believe that this year might rank in the top three ever. What has made this year even more unusual is the large number of 50 to 70 pound loggerhead sea turtles stranding. Most years, the Aquarium treats a handful of the husky, chestnut brown colored turtles. 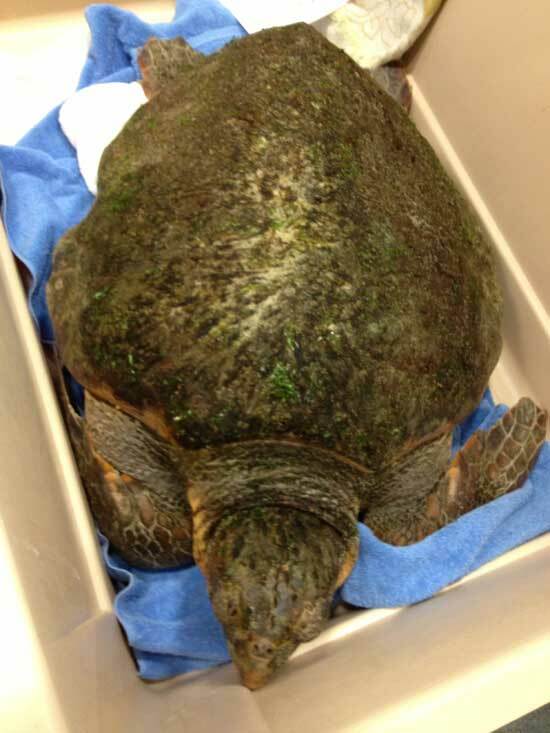 In the past 24 hours, seven loggerheads have already been rescued. The large turtles strain the available tank space in a facility that is designed to care for about 100 sea turtles. Plans are already underway to move some of the healthier animals to other sea turtle facilities, particularly in the South. The Aquarium is seeking the services of volunteer pilots with their own planes who might have room for some unusual and precious cargo for flights to Virginia, Georgia and Florida. The Aquarium and Mass Audubon have rescued, rehabilitated and released over 1000 endangered sea turtles in the past twenty years. Private donations have been key to sustaining this effort that has been making a tangible difference in the recovery of the world's most endangered sea turtle. Find out how you can support sea turtle rescue efforts here. Follow the our blog for the latest on this busy season. 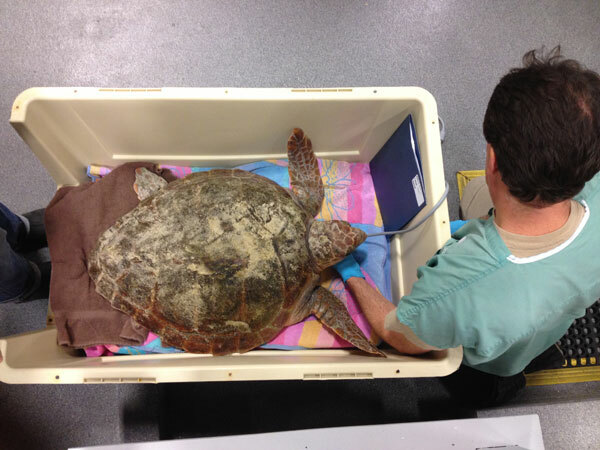 Watch video of previous sea turtle patients in treatment here. See how dedicated rescue staff and volunteers celebrate holidays. And look for media coverage about this season's more recent sea turtle rescues here, here, here and here.